These beautiful cupcakes are rich, moist and full of champagne flavor. They are topped with a luscious champagne buttercream, and some gold sprinkles to make them extra special! 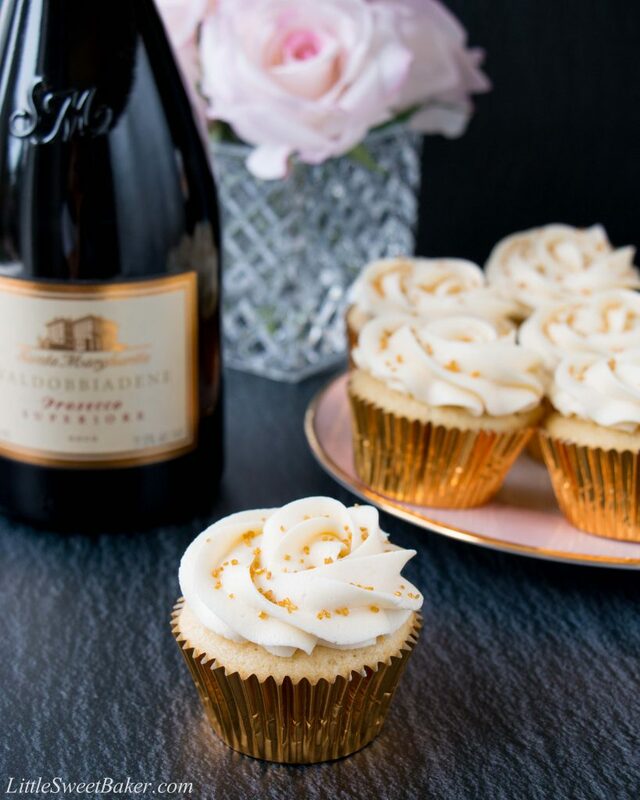 I wanted to make something fancy this week for Mother’s Day coming up, so I thought champagne cupcakes with some gold bling would be fitting because all moms deserve a little glam once in a while. Being a mom is the best job in the world, but it can a thankless job and it’s certainly not a very glamorous one. So cheers to every mom out there, and thank you for all that you do! 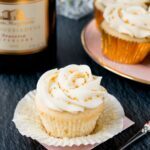 This white vanilla cupcake recipe from Boston Girl Bakes is elevated with the addition of champagne to the batter. I flavored the buttercream with a champagne reduction which is a technique I learned from Sally’s Baking Addiction. I also brushed some of the concentrated reduction on top of the cupcakes for a more prominent champagne taste. 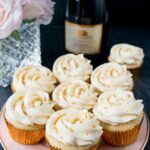 And let me tell ya, a splash of bubbly not only brightens up the flavor of these cupcakes, it lightens up the overall texture as well. 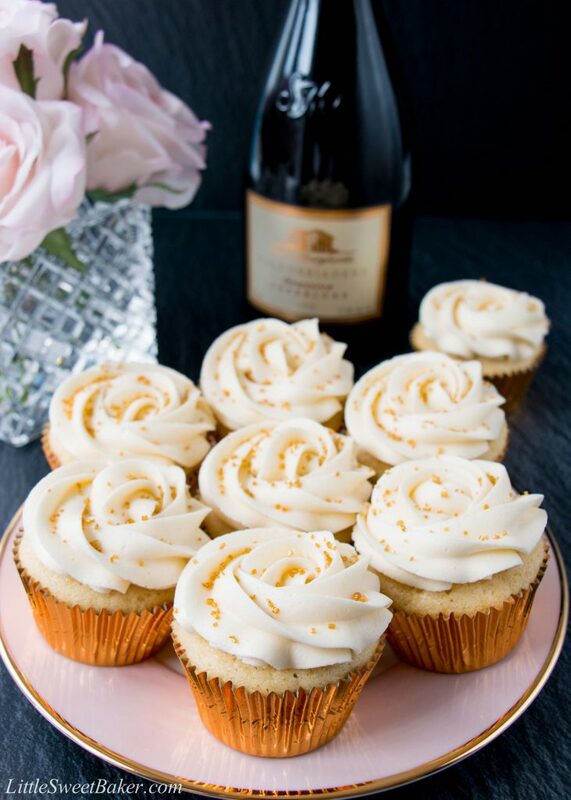 These champagne cupcakes are fluffy and moist. They have a rich-buttery flavor with an elegant aroma. 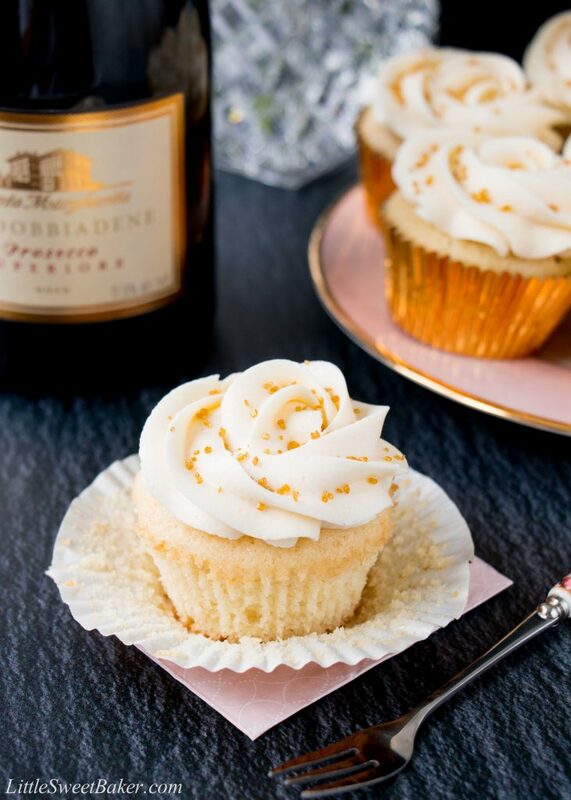 The buttercream is smooth and creamy with the sparkling taste of champagne. 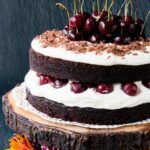 These cupcakes are definitely in a class of their own and are perfect for any special occasion, especially Mother’s Day and New Year’s Eve. These beautiful cupcakes are rich, moist and full of champagne flavor. 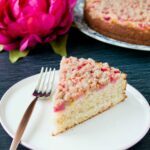 They are topped with a luscious champagne buttercream. Preheat an oven to 350F. Line a standard 12-cup muffin pan with paper or foil liners. 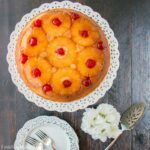 In a large bowl, using an electric mixer, beat together the sugar and butter on medium-high speed until light and fluffy, 2 to 3 minutes. Reduce the speed to low, add the egg and egg white one at a time, beating well after each addition, then beat in the vanilla. Add the flour mixture in 3 additions, alternating with the champagne in 2 additions, beating until just combined. Scrape down the sides of the bowl as needed and be careful not to over beat. Divide the batter evenly among the prepared muffin cups, filling each about three-fourths full (you should get about 11-12 cupcakes). While the cupcakes are baking; in a small saucepan, bring the champagne to a boil over medium-high heat. Reduce to medium and allow to simmer until it reduces down to about 1/4 cup (about 8-10 minutes). Reserve 2 tablespoons of the reduction for the frosting, and use the rest to brush on top of the warm cupcakes. I brushed each cupcake twice with the reduction and discarded the leftover. Let cupcakes cool completely before frosting. In large bowl, using an electric mixer, beat the butter, powdered sugar, vanilla and 2 tablespoon of the champagne reduction until smooth. Frost as desired and sprinkle with sparking sugar.